INDEPENDENCE, Mo. — Davionna Lagrone is home for the holidays. "It feels really good," she said. Lagrone, 20, has never been away from her family before, so the past seven months as a fire control specialist in the U.S. Army have been an adjustment. Her family thought they'd spend the holidays without her. They didn't think they would see her until 2020. Little did they know, Lagrone and her grandma, Denise, have been scheming for three months, planning a day of surprises. 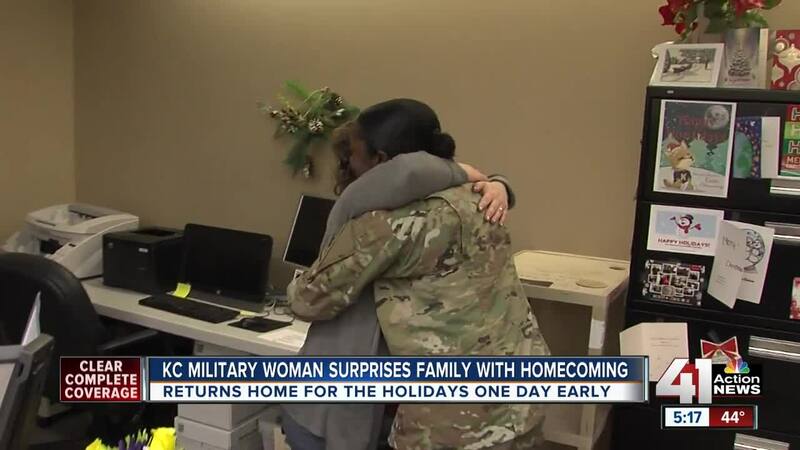 Lagrone surprised her mother, Amy Mason, on Wednesday at the Independence School District, where Mason works. Mason's coworkers had planned a fake meeting to make sure she was in the room as Lagrone came through the door. "You can stop crying, Mom," Lagrone said after their reunion. "I'm so excited I can't even talk now. Yes, I'm so happy because it's been so long since I've seen her," Mason said. Mason said letting her daughter go out into the world was hard. "I'm so proud of her. She's went through so much and just to see her now, it's wonderful," Mason said. Mason and her husband, Haywood, are technically Lagrone's aunt and uncle. But they've long since shed those titles, and to Lagrone, they've always been Mom and Dad. "She's been my mom ever since she adopted me and my sister. She's always been there. I just couldn't ask for better mom," Lagrone said. The family's day of surprises didn't end there. They then headed to Fairmount Elementary, where Lagrone's dad is a custodian. Principal Jeff Anger called Haywood Mason over a walkie-talkie, making up a story about a spill in one of the classrooms. Of course, that wasn't true, and Mason was caught completely off-guard when he walked in to see Lagrone. "She's pretty sneaky because she called me yesterday and she was talking all kinds of stuff on the phone. I was just being ornery, saying if she didn't give me what I wanted for Christmas she can take it back, and now she's here today," he said. Lagrone said she thought she'd get some tears out of her dad, but he did his best to hold them in while the cameras were rolling. "I really look up to my dad. He's always been there, he's always taken care of me and been strong for me. I love what I do and I love that it makes everyone proud, especially my dad," Lagrone said. The day ended with Lagrone coming out from behind a curtain at William Chrisman High School during her brother's football signing day ceremony. The family plans to make the most of the next two weeks before Lagrone gets her military orders.